Some new hardware paid a visit to the FCC. 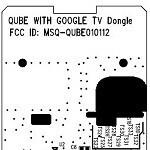 “Qube with Google TV Dongle” is headed prominently on the labeling schematic, so it is no mystery what the intended use is for this component. Being designated a “dongle” certainly means it will simply plug into a Smart TV set-top box or computer and provide Google TV connectivity. It will be controlled by O!Mobile Control Center, which was developed by ASUS and available for Android devices running Android 2.1 or higher. The control is handled via 2.4GHz Wi-Fi. Outside of the copious amount of information in the FCC documents, what we do not know is when this will be available, and how it will be available, either as a stand-alone or as part of an equipment or accessory bundle. Google +dish network =android dish. apple TV, ubuntu Tv, google TV whats next? and who's better? Whats next? Hopefully the death of cable tv and satellite companies with all their commercials. Like to see A FULL SONY GOOGLE TV That would be awesome!